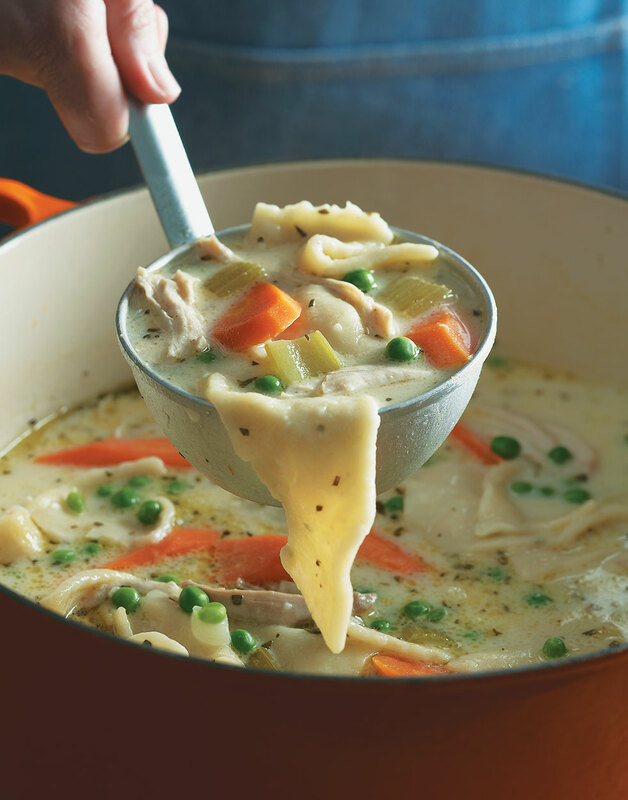 No matter what you call it — chicken and noodles or chicken and dumplings — you'll definitely call it amazing. And if you thought chicken soup was food for the soul, you are spot on! Sweat onions, carrots, celery, and herbs in butter in a covered Dutch oven or large pot over medium-low heat until carrots are fork tender, 15 minutes. Stir in flour and cook 1 minute. Deglaze the Dutch oven with wine and lemon juice, then whisk in broth, milk, and cream. Remove and reserve 1 cup milk-broth mixture, then add chicken and peas; season with salt and pepper. Prepare Noodle Dumplings; cook in soup as directed. Season soup with Tabasco, if desired. Deglaze the Dutch oven with white wine scraping up any browned bits to add flavor to the soup base. Ladle out and reserve 1 cup milk-broth base (avoiding the celery and onion) to mix with the dumplings.